Water Hazards Rule 26 – 1 – All areas defined by yellow posts. Lateral Water Hazards Rule 26 – 1 – All areas defined by red posts. Drop Zone at 17th Hole, as a Local Rule a player’s ball that enters the water hazard may take relief at the drop zone under penalty of one stroke. This has been confirmed with the R & A.
Immovable Obstructions Rule 24 – 2 – All bridges, fences, internal pathways, overhead wires, fixed sprinkler heads, staked or newly planted trees (under 2 metres). Relief can be taken without penalty, no nearer the hole. Movable Obstructions Rule 24 – 1 – Stones in bunkers are movable obstructions. A ball landing on the ‘short cut’ on the 6th fairway when playing the 4th is deemed Out of Bounds, also when playing the 9th, any ball landing in the parking area outside the existing Clubhouse. Ensure the 16th green is clear before playing your shot. Please ring the bell after clearing the 16th green and after playing the 4th & 5th fairways. The borders and boundary edges and fences of the course are Out of Bounds and are defined by ‘white posts’ or ‘white markings’ this includes the fences at the NE of the 18th green. Marked GUR areas are identified by white markings: Stoney areas on the course are subject to a ‘free drop’ if playing partners concur, at the nearest point of relief. Environmental Areas Rule 25 – 1 are defined by blue posts, marked GUR. If the ball finishes in these areas it is to be dropped at the nearest point of relief and subject to a free drop. Blue Tees. These are for the exclusive use of members. 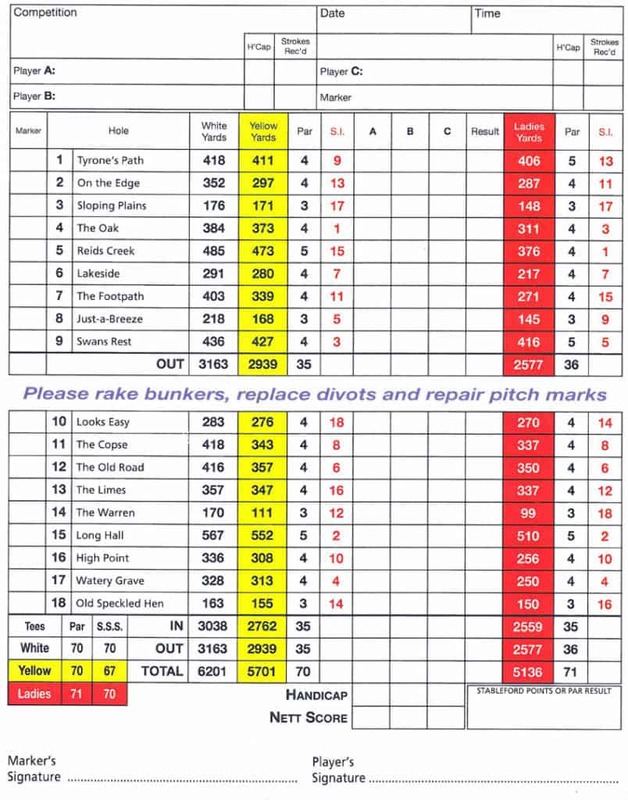 Penalty for Breach of Local Rule: Match Play – Loss of Hole. Stroke Play – Two Strokes. All golf related activities can be dangerous. It is a condition of membership and the use of the course and the facilities of Mardyke Valley Golf Club that players, visitors and members carry their own insurance and indemnify the Company against all claims in respect of injury damage or loss arising out of their presence on the course or in the clubhouse area. The Company will accept no liability in respect of any injury, loss or damage however caused. Players are reminded of Rule 1 of the R and A Rules of Golf, which stresses the need for care and vigilance before striking a golf ball, which applies at all times. Particular care must be taken to look out for and give way to walkers using the public footpath passing the left hand side of the 7th fairway and left hand side of the 8th fairway, which are adjacent to the tees.